Our CorTemp® Ingestible Core Body Temperature Sensor wirelessly transmits core body temperature as it travels through the digestive tract. The sensor’s signal passes harmlessly through the body to the CorTemp Data Recorder worn on the outside of the body. 262 kHz or 300 kHz. The silicone coated sensor contains a micro battery, quartz crystal, communication coil and circuit board, all encapsulated in medical grade epoxy. 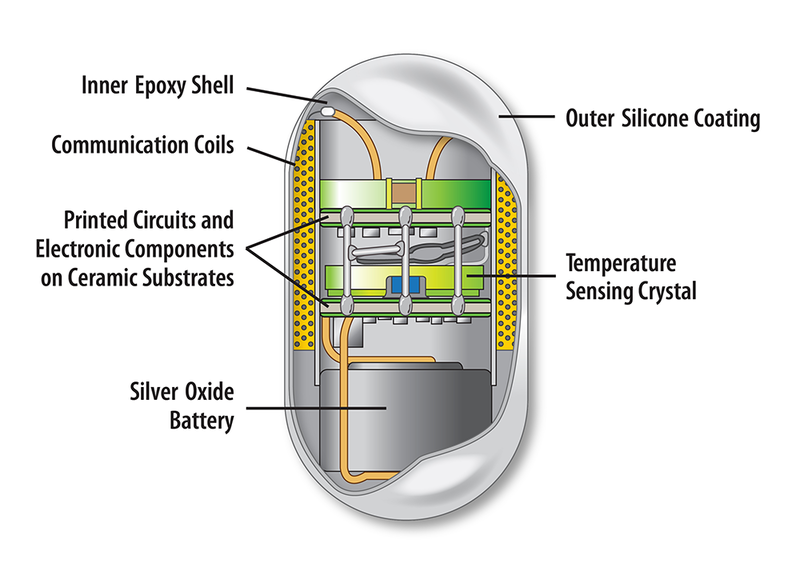 Once ingested, the crystal sensor vibrates at a frequency relative to the body’s internal temperature, produces a magnetic flux and transmits a low-frequency signal harmlessly through the body. The sensor passes through the body at the subject’s normal rate of motility which can vary anywhere from 24-36 hours. Monitoring can be extended by administering another sensor after the initial pill has passed. The CorTemp sensor is accurate to ± 0.1°C and is FDA cleared and registered as a single use device.